With this post, I'm pointing to a list of books I started on Google Drive. It is an effort to keep track of all that is out there, by Native and non-Native writers and illustrators. 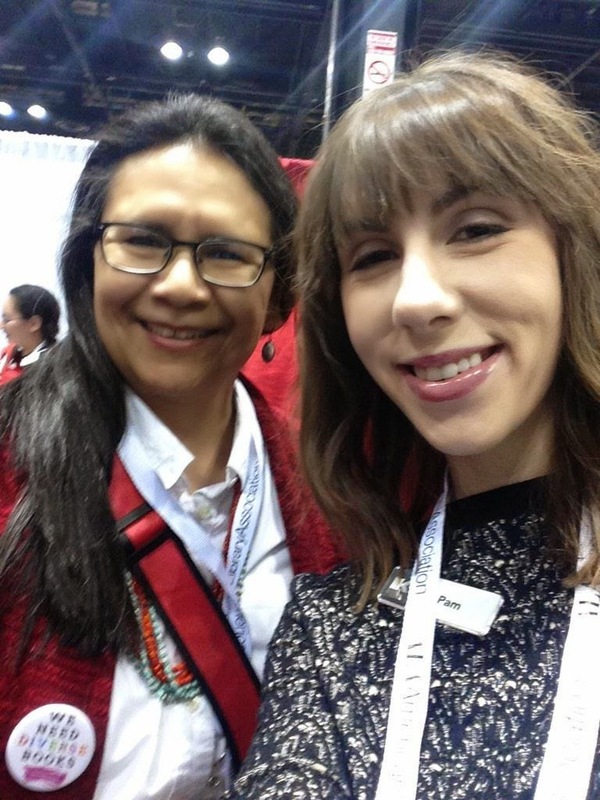 The list has columns for author(s), author's Native Nation, illustrator(s), illustrator's Native Nation, book title, publisher, year of publication, and date added to list. The far right column is where I'll add the date if/when the book is reviewed here at AICL. You'll probably look at it and be surprised that, for example, there is no review at AICL of Bruchac's Children of the Longhouse. The reality? Not enough time to read everything and write it up. If you download the list for your own purposes, please credit me (Debbie Reese) for your use of the list. If you are interested in helping me build the list, let me know (dreese dot nambe at gmail dot com)! It is a huge undertaking and I'd love some help. Sources for the list include, but are not limited to, the CCBC, Goodminds, Oyate, Birchbark Books, and all the librarians, teachers, parents, students, and professors who write to me to ask about a book. Last year, Pamela Penza wrote to me about Nick Lake's There Will Be Lies. Pam is a young adult librarian and blogs at Pamelibrarian. I read her review of There Will Be Lies at Goodreads and then got a copy of the book and eventually posted my review. Earlier today, Pam tweeted frustration with an Indian Princess in a book she reviewed. I asked her for details and she pointed me to her review. I read her review, and decided to share part of it here, with the intent of telling you that you ought to follow Pam's blog. I'm very glad she's noting problematic content like that in There Will Be Lies, and today, in Tricia Stirling's When My Heart Was Wicked. Here's an excerpt of Pam's review, but DO GO READ all that she says. And check out the book covers she inserted at the bottom of her review. Such comparisons are fascinating. "Over two hundred years ago, the Maidu Indians lived right here along this creek in their houses made of bark. I think about them, the Maidu, and how much they knew about the natural world. Soap plant and sweet Indian potatoes, deer grass and yerba santa. They were immune to poison oak, so they cooked their bread in the leaves and wove the branches of the poison oak into baskets ... I wish a real live Maidu woman would come out of the bushes and teach me. We'd weave a basket to carry sorrow for all the old ways that are gone, and then another one to carry hope." Saying again, DO GO READ all that Pam wrote about the book. There's a lot to say about When My Heart Was Wicked. Published in 2015 by Scholastic, it is disappointing. I participated in the "Are we doing it white?" conversation at Read Roger (Roger Sutton's blog at Horn Book; Sutton is the executive editor at Horn Book; The Horn Book is highly regarded in children's literature). His 'we' is white people and the 'it' is reviewing. He references a conversation he had with librarian Nina Lindsay in which she asked if it is time to "shake up our standards" in reviewing. At one point in the 'Are we doing it white' conversation, Roger said he would love to have more reviewers at Horn Book that aren't white, and that he is "intensely devoted" to "getting out information about cultural diversity--who's out there, what's out there, and what's NOT out there" (see his comment at 12:28). I reviewed for Horn Book in the 1990s. Remember when you decided it was inappropriate for me to use the word stereotype to characterize a kid playing Indian? You decided to give the review to someone else. Later, in a review of a nonfiction book about California missions, I said the author was ignoring new research on the missions, and that review got reassigned, too. Those were terse moments for me. I was furious. All the power was yours, and it dictated what I could or could not say as a HB reviewer. Because of those two experiences, it was not hard for me to decide to move on and focus on my dissertation. I think if you hadn’t done that, I wouldn’t have left. Would it be different if I submitted those reviews today? Debbie, how could I forget? Actually, i *do* forget what happened with the book about the missions but remember the playing-Indian question very well. In this book, THE BIRTHDAY BEAR, two contemporary white children and their grandfather, among other activities, put on fake headdresses and pretend to be Indians. In regard to your review of this book, nothing would be different today. You criticized it not for inaccuracy or stereotyping but because the characters in the book engaged in an activity you found objectionable. We can’t knock a book because we morally disapprove of its fictional characters’ actions. What I said then I’ll say now: I take the ALA’s Library Bill of Rights very seriously, and I believe “materials should not be proscribed because of doctrinal or partisan disapproval” with all my heart. I haven't been able to find the review I submitted it I've added it below, along with the one Horn Book published (it was written and submitted in the 1990s). I'll keep looking. Perhaps there is one in Horn Book's files. I probably gave it a 6 in my overall rating, which is "unacceptable in style, content, and/or illustration." I wrote an article based on the rejection of that review. It includes some of the emails that were exchanged by me and Roger. If you'd like to get a more in-depth look, I'm sharing the article as a pdf: Contesting Ideology in Children's Book Reviewing. It was published in 2000 in a Studies in American Indian Literatures, the journal of the Association for the Study of American Indian Literatures. As readers of AICL know, I don't recommend books where kids are playing Indian. They invariably do that in a stereotypical way. During the time I was reviewing for Horn Book, they were sending me books with Native content because they believed I had the expertise to review those books. In the case of The Birthday Bear, Roger also felt that it should not have been sent to me because the kids playing Indian was "peripheral" to the story. It may have been to him, but it wasn't peripheral to me. As the article and the on-going discussion at Read Roger show, neither Roger or myself have shifted in our views on this particular incident. Roger titled his post "Are we doing it white?" Yes, you are. Indeed, you do it with glee, as evident in your reply to Sarah Park Dahlen (see his comment at 3:37) where you say that you "happily recommended" a book in which kids are playing Indian. Please read the conversation at Are we doing it white. I appreciate the personal notes of support I've received, and I especially appreciate the work we're all doing to push back on the power structures that use that power to affirm the status quo. We're all doing it for young people who read. What they read matters. (5) Illustrated by Uli Waas. Translated from Dutch by J. Alison James. (1996) First published in Switzerland, this story (set in the United States) is about David and his sister Sally and a visit to their grandparents home in the country where they celebrate David’s seventh birthday. His penchant for Indian adventure stories figures prominently spurring the children to do feathered headdresses and play Indian. Although grandfather says “Now most Indians dress just like you and me.” (p. 20), the dominant text and illustrations of the play Indian theme fit the objectionable stereotype of the aggressive savage Indian. DR. I said "objectionable stereotype of the aggressive savage Indian" and Horn Book said "pretend to be war-whooping Indians." When he posted the Horn Book review, Roger said "Any reader of that review who had issues with 'playing Indian' could not say that we didn't tell them." An obvious question is 'what about the reader who doesn't know that playing Indian is usually done in a stereotypical way? Later in the discussion, Roger said that he thinks stereotype is the wrong word for what is going on when kids play Indian. He thinks that it is "bad behavior" that is "unmediated by authorial comment or correction." Today--Feb 24, 2015 (one week later)--the conversation at Are We Doing It White is still on-going. There is a lot to read and think about there, so again--please read it. Today (Feb 18, 2015), the Cooperative Children's Book Center at the School of Education, University of Wisconsin-Madison, released statistics for books they received in 2014. For AICL, I focus on data specific to American Indians. This is raw data and does not address quality of books. It also does not represent all books in any given year that have Native characters or content. A good example is Little House on the Prairie. In 2010, that book was reissued with colorized images inside. It has a Native character and a great deal of Native content, but I doubt that its publisher sent it to CCBC as a "book about American Indians." And even if they had, CCBC staff may have determined the character and content were not significant enough for it to be listed as a book about American Indians. I am very glad to have CCBC's data each year. There is much to do with it. For now, here's the data, from 2002 through 2014. Once I have the book list for 2014, I'll do some analysis similar to what I did in 2013. Some things I want to know: Who are the authors/illustrators of those 17 books written or illustrated by American Indians? In past years, a single author (Joseph Bruchac) has published more than one book. Still, last year the number was 18, and this year it is 17. That is significant. It is the only two-year-period in which we see consistency, and it is also the highest number(s) overall. Numbers for next year will be interesting. Will we stay up at that number? Or will it skew down again? It is also important to note that, for 2013 and 2014, we see that approximately half the books CCBC received were written or illustrated by Native people. I like that! And of course, the numbers for 2002 and 2003 stick out (74 and 95, respectively). I need to find that list and see if I can figure out why they were so high then. Please share your observations, calculations, etc. CCBC tweeted out a chart that I want to share here, too. The chart, as you see, covers the various groups for whom CCBC keeps data. This is an especially helpful chart. Such charts should show growth over time. That is clearly not the case and is a strong indicator of work that must be done. 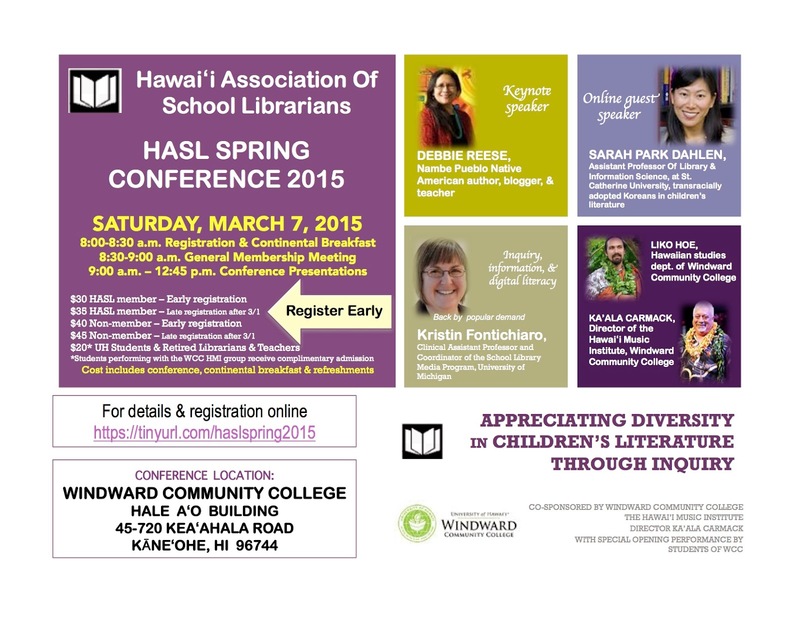 Going to Hawaii Association of School Librarians Spring Conference! I am looking forward to spending time with you at your spring conference! I've been working on my remarks. If there is anything in particular you want to ask me ahead of time, please do!